Minnesota is the nation’s leading sugarbeet producer. As a result, sugarbeets play an important role in the state’s economy. Southern Minnesota Beet Sugar Cooperative (SMBSC), located in Renville, is a major beet sugar extraction cooperative. Given its production and extraction role, SMBSC wanted to understand its contribution to the regional and state economy. The primary study area for the analysis is the 20-county region in which SMBSC shareholders grow sugarbeets. SMBSC partnered with the University of Minnesota Extension to study the economic impact of SMBSC. For further reading, see below for SMBSC’s Economic Contribution infographic and the full economic contribution report. Whether you would like to understand general safety or more in-depth knowledge of safety to protect yourself, workers, or family members from electrical, ATV, PTO, and other farm hazards, please Click Here to be forwarded to the National Farmers Union web page. The web site has several videos as well as key pointers to protect you from the hazard. ‘Roots in the ground’ is growing as a mantra among crop farmers experimenting with and using ‘cover crops’. Oats, rye, turnips, radishes, and various seed mixes planted after harvest help protect soil from wind and water erosion, soak up excess nutrients, and build up organic matter. Today, as the soil, water quality, and production benefits of using cover crops are better known, acceptance in interest in the practice are growing. 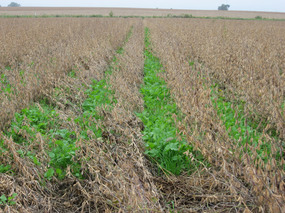 Photo: Fall growth of cover crop in soybeans. In south central Minnesota the largest number of cover crop acres is being claimed by members of the Southern Minnesota Beet Sugar Co-op in Renville County. Since 2000, the co-op’s spring cover crop program has expanded to include more than 80 percent of its total of about 120,000 member acres. While most of the co-op’s cover crop acres are planted in spring, some growers are trying fall cover crops, which offer greater benefits. The co-op’s research and monitoring show an average yield increase of $50 per acre on cover crop fields. “We now understand that it’s good for both the beets and the soil,” says Todd Geselius, vice president of agriculture. Growers receive $4 per acre from the co-op for cover crop seeds, and can also seek technical and financial assistance for fall-planted cover crops from the Renville County SWCD office and Hawk Creek Watershed Project. Most of the co-op’s cover crops are being planted in spring, which protects emerging beet plants. Fall-planted cover crops extend the benefits to soil over the winter. The Renville SWCD/Hawk Creek Watershed cost-share program is for fall cover crops to protect the soil, build soil health, feed soil biology, suppress weeds and improve soil structure. “Our program is to provide financial assistance for local farmers to seed a fall cover crop to keep the soil covered through the fall, winter, spring,” says Holly Hatlewick of the Renville SWCD. Renville County producers using fall cover crops are reporting a five- to seven-bushel yield increase on their cash crops the growing season after they have a fall cover crop, Hatlewick says. One of my favorite times of the year is when harvest is underway. The crispness in the air and the smell of what farmers harvest is as pleasing as a warm apple pie out of the oven. When harvest wraps up, I like to go to the local café and listen to the farmers talk about yield and the little kid discussion of what brand of equipment or seed is better. A new joy for me during this time of year is seeing all of the Cooperative team members working together with a purpose. That purpose is Zero Lost Time Injuries, 100% Environmental Compliance, and Uncompromised Quality. It is a purpose worth working for. We all provide for something, ourselves, our families, our employees, our communities, and our Cooperative. To our knowledge since the safety records have been kept, this 2017 beet harvest saw the lowest incident rate ever. With the help of everyone working together, we are accomplishing greater things. We thank you for all of your efforts. This would not be accomplished without your commitment and diligence in the process. from driving onto the piler. However, there were a few from truck drivers that were getting cut, pinched, or tripping on a pile site. To help out with the recognition of hazards on the pile site, we have developed the Truckers Safety Rules and Truckers Safety video. If you have not viewed them or heard of them before, click on the hyperlink with the name and you will be directed to them. do to eliminate the incident in the future. Your input is also valuable before an incident occurs. If you observe a hazardous situation, please let us know. We all have different things we look at every day. Sometimes it is the difference in our perspective that allows one person to see a potential hazard while another does not. We will work together on a method to minimize or eliminate the situation. Once again as we put this harvest in the books, Thank You for your efforts on many levels, Safety, Environmental, and Quality. Without your help, the Cooperative would not be what it is today. In anticipation of the upcoming harvest season, it’s important for those in farming communities to be well-prepared and safe. Long hours, powerful machinery and isolated jobs all make the risk of farm-related injuries, which can often be fatal, quite high. However, remembering a few dependable safety practices and picking up a new tip or two can help you avoid a serious accident. To read more from the Mayo Clinic article please Click Here. Renville, MN – July 21, 2017. Southern Minnesota Beet Sugar Cooperative (SMBSC), a farmer-owned producer of refined sugar and sugar beet co-products, announced today it has reached an agreement with its labor union for a five-year labor contract. The Bakery, Confectionery, Tobacco Workers and Grain Millers International AFL-CIO/CLC, Local 369 has voted to accept SMBSC’s offer, the contract effective July 23, 2017, which calls for an increase in wages over five years. Other terms include updates to pension benefits, pension lump sum death benefits and life insurance benefits. With planting season upon us, it is an optimistic time of year. It can also be a dangerous time as well. Roadways not only being operated on by motor vehicles, but also farm vehicles can cause hazards on the roadways but also on the farm site as well. An article written by the United Soybean Board has an excellent article on planting safety. Click Here to be directed to the article.